Everything Rachael Ray: Ladies and Gentlemen, Start Your Preordering! Ladies and Gentlemen, Start Your Preordering! What a good couple of days! Yesterday I got my new edition of Every Day with Rachael Ray, which features BBQ recipes just in time for planning my upcoming Memorial Day BBQ. 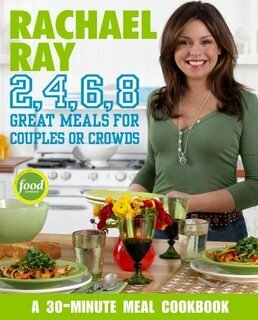 Then, I find this new book from Rachael Ray, 2, 4, 6, 8 : 30-Minute Meals for Couples or Crowds, which will release on November 7, 2006. There's a little bit more information than last time I ran across it, including what the cover will look like. And it has jumped about 150,000 spots on the Amazon sales ranking list. Since I am always cooking for just the two of us, I am excited about this one! Sometimes it would be nice to not figure out how to properly split the recipe or to decide whether or not to split the recipe at all. How lazy am I?